Hi! My name is Violet Port, and I am breaking boundaries! Why? I am a DRUMMER! I am a FEMALE DRUMMER! 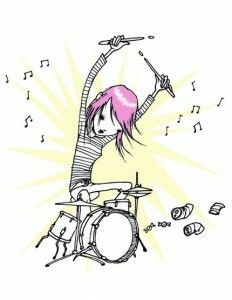 Being a drummer is belonging to your own musical species, but being a female drummer is a rarity. Female drummers demonstrate extraordinary energy while also radiating their own brand of uniqueness. Drumming is a different type of music compared to other musical instruments. Drummers feel our music differently. I am Violet Port, a confident young female drummer and it radiates through my drumming. my YouTube Channel, Violet Port!